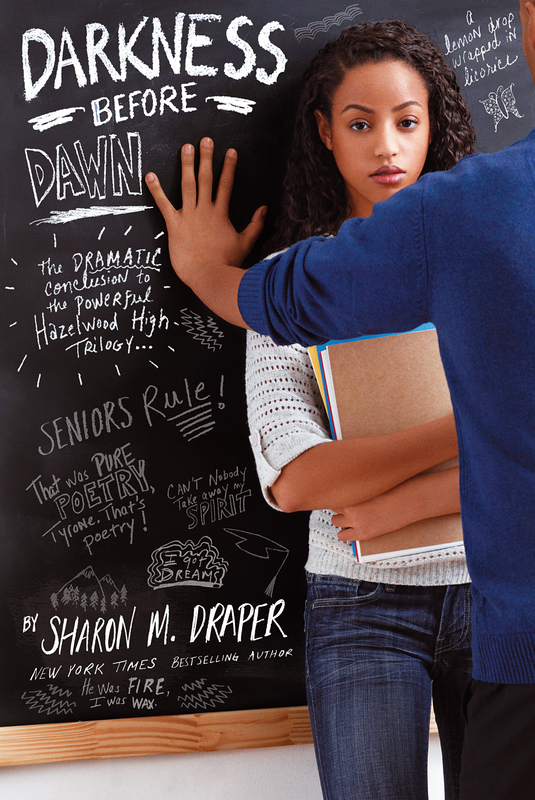 Hope shines in the face of fear in this conclusion to Sharon M. Draper’s award-winning Hazelwood High trilogy. I think homeroom is a stupid waste of time. They take attendance, read announcements, then make you sit in a room watching the clock when you could be in a class, maybe even learning something. Dumb! Mr. Whitfield is OK as a teacher—he’s probably too nice, so kids take advantage of him sometimes, like I’m getting ready to do. “Jackson? . . . Jackson? . . . Is Andy absent again?” Everybody looked at me like I’m supposed to know where Andy is at every single moment. I’m not his mother. I’m not even his girlfriend anymore. I ignored them all and dug in my book bag for a pencil. “Yeah, Mr. Whitfield. He’s got ‘senioritis,’ a terrible disease.” Leon thinks he’s so funny. Everybody laughed but me. “Well, since he’s only a junior, I’d say that he’s got a fatal disease. Juniors who catch senioritis have been known to develop serious complications and never graduate,” Mr. Whitfield said jokingly. I wasn’t really sick. I shouldered my book bag and headed out of the room without looking at Mr. Whitfield. I was still upset about breaking up with Andy, and I just needed some space. I glanced down to the end of the hall where I saw my best friend Rhonda heading my way. 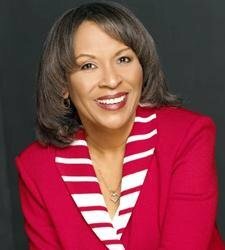 She yelled down the hall, “Hey, Keisha, have you seen Andy this morning?” A couple of teachers stuck their heads out of their doors, but Rhonda ignored them as she hurried down the hall toward me. “No, I’ll probably just catch a movie on cable. It’s kinda nice just to relax for a change and not worry about how I look or what I’ll wear or where we’re going. I’m just going to chill and enjoy my freedom.” I said the words, but Rhonda knew I didn’t mean them. When Rhonda had called me later that night, however, she was crying hysterically about Andy and blood and a gun. She wasn’t making any sense at all. “Andy’s dead, Keisha. He shot himself. Monty found him when he got home from school. I got there about the same time Andy’s mom got home. It was awful! Oh, Keisha!” Rhonda dropped the phone and all I could hear was heavy, choked sobs coming from her. I didn’t cry right then. But it felt like a huge rock landed inside my chest and just sat there. I didn’t want to believe her, but soon it was clear that it was all too true. Andy had taken his own life. I felt dead, too. Like living was stealing breath. I felt like it was my fault, even though I knew it wasn’t. Andy had been really messed up inside since that terrible car crash last year after a basketball game. Andy had been driving the car and had been drinking. His best friend Rob Washington had died. I guess he just couldn’t get over his feeling of guilt for Robbie’s death. I also knew that part of the mess in Andy’s head had to do with us breaking up, but I wasn’t gonna be caught up in that same guilt trip. I felt like I was going to explode. I heard the door open downstairs; my mom had just come in from work. I ran to her and screamed, “Mom, oh Mommy, Andy’s dead!” I let her hug me like she used to do when I was little. My nose was all stopped up and all I could do was gulp and sniff and cry some more. “It’s all my fault!” I moaned. “How could he do this? Why didn’t he call me? Andy can’t be dead! Oh, Mommy, it hurts so bad!” I couldn’t stop crying. I never knew a person had so many tears inside. “He did call,” my mother said quietly. She was really crying now. I looked up at her in disbelief. “When?” I asked suddenly. jumped up and glared at her. My eyes, which were already red and burning from all the crying, felt like hot swords as I glared at her. “I guess you’re right. Let’s hurry.” My voice was tight and I avoided the offer of a final hug from my mother. I pretended not to notice my mother’s outstretched arms as I looked for the car keys, and I refused to look her in the eye as we walked out the door. I was silent as we rode to Andy’s house. When we got there, at least six police cars crowded Andy’s little street and a bright red ambulance sat in the driveway, red lights blinking in the dusk. Crowds of kids from school huddled together. Even boys were crying without embarrassment on the front lawn, and girls sobbed together, using each other for support. Rhonda sat on the damp lawn with Tyrone, pulling blades of grass from the earth, one at a time, unable to cry anymore, I guess. Her eyes were red and swollen like mine. Tyrone sat very close to her, his arm resting on her leg, looking like he was barely holding in his own tears and anger. He and Andy had played together on the Hazelwood High School basketball team, and had been friends since seventh grade. “No, Tyrone,” I flashed back at him. “He did it to all of us!” I couldn’t look at Tyrone anymore. I hated that Rhonda had Tyrone there to hold and comfort her, while I had no one. Gerald, another friend and basketball teammate, arrived with his fourteen-year-old sister, Angel. His face was twisted with confusion; Angel was sobbing and sniffling. I walked over to Angel, hugged her, and let her cry. Poor kid. Angel and Gerald had already been through more than their share of unhappiness and death. I glanced over at Gerald, whose face thanked me silently for trying to comfort his sister. “I ain’t got over Robbie bein’ dead,” Gerald told me quietly. “High school boys ain’t supposed to die. They’re supposed to act stupid, and flunk tests, and chase girls, and get out of school, and live. Not die. And now Andy is dead, too? I can’t deal with this!” He clenched his fists. I couldn’t say anything. He was right. Just then another car pulled up and Rob’s fourteen-year-old sister, Kiara, rushed out of the car and over to Angel. I watched as the two friends ran to each other and wept as they tried to console each other. So many tears. I could see Andy and Monty’s parents through the front window, huddled together on the sofa. My mom went in and sat with them, once again offering her shoulder as a pillow for pain. Policemen marched in and out of the house, barking orders into their shoulder radios. I didn’t notice Monty at first. He was sitting alone in a swing on the lawn of the house across the street. I left Gerald, wiped my eyes and breathed deeply, and walked slowly across the street to Monty. When me and Andy used to study together at his house, Monty’s bright eyes and crooked-toothed grin always greeted me at the door. But what do you say to a second grader who’s just found his brother’s body? “Hey, Monty,” I said quietly. He didn’t answer. He was wearing Andy’s school jacket, the one that said Hazelwood High in large, shiny silver letters. “You need a hug?” I asked. Monty nodded slightly. I sat down next to him and held him gently in my arms. I pushed with my feet and let the swing rock us both gently. Neither of us spoke. I felt Monty relax a little and I hugged him closer to me. The evening air was cool; the early spring sun had left little warmth. As the day ended and the night took control, me and Monty cried together in the swing. We kinda shielded each other from the wails of the kids as the plastic bag that contained what had once been Andy was removed from the house. The ambulance left with blinking lights, but no siren, and everyone was left with only darkness and silence. It was then that Monty’s mother frantically called out to him from the house. I guess she realized she hadn’t seen him in a while and got worried. Reluctantly, he gave me one last hug, left the swing, and ran across the street to his mother, the arms of Andy’s jacket dragging the ground.